And now for the final post about #Uksmnachsrte2106 (sorry, been typing it so many times I have forgotten how to type) (that looks like a joke but I corrected about half the words typed in this sentence just now so it isn’t) (my autocorrect has just given up on me and gone home). The final official day was on Saturday July 30th, we had a Closing Ceremony, and they announced that CHICAGO will host the next one! Hooray! I do hope I can go. 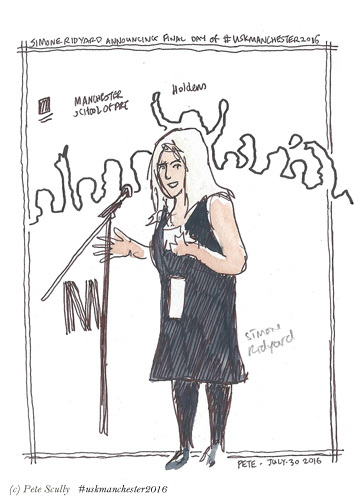 Anyway here are a few more sketches of people that I did over the days of the Symposium, in no particular order, but starting with Simone Ridyard, above, Manchester resident and one of the main organizers of this whole awesome successful symposium. Here she is announcing day three, with some of the main stage backdrop behind her. Well done Simone and all the Symposium team! I have Simone’s book Archisketcher, by the way, it is very good. Next up is Bridget March, a lovely lady I met in the first workshop, who is from Harrogate (I had a friend at school from Harrogate, sounds nice there) but lives and works in Saigon in Vietnam. We ate with some others at a great little street-food type snack bar on Oxford Road, while rain drizzled down outside. 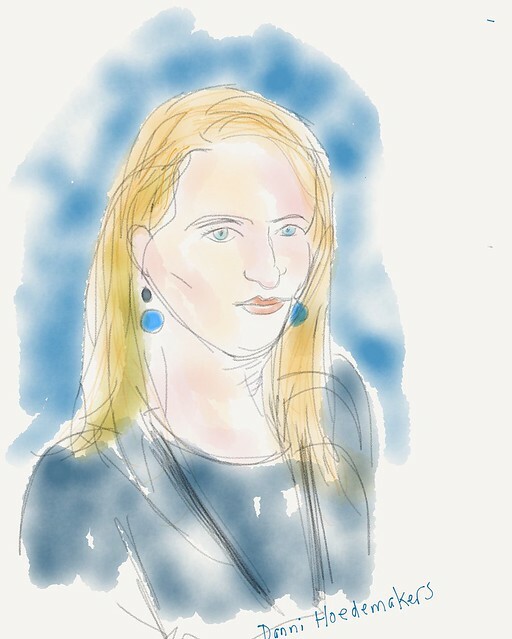 Here I did my only digital sketch of the Symposium, made on the iPad with the Paper app. this is Danni Hoedemakers, from Belgium (Hasselt), who I met talking with Corinne Raes at the Peveril of the Peak. She was telling me about these really interesting tours of Hasselt that she gives, “Happiness Tours” I think they were called, which I really liked the sound of, though I struggle to explain them. This gave me a few ideas of doing similar things but including sketching or writing. Anyway, it sounded like fun. There were quite a lot of Belgians at the Symposium, always a good thing, allez les Belges! 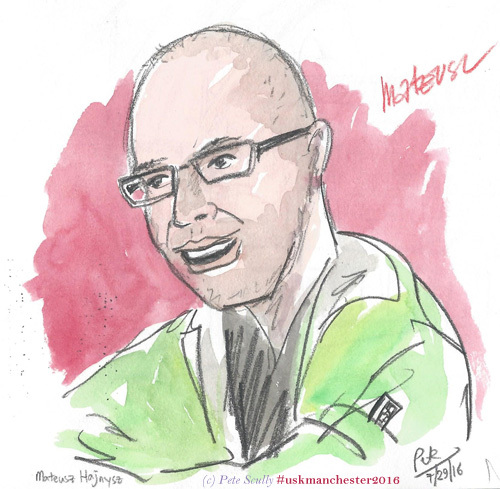 Now here we meet Mateusz Hajnsz from Poland, who I remember from the USk Manchester facebook page, nice to meet him. He actually had a copy of my book to be signed! So I sketched him as well. 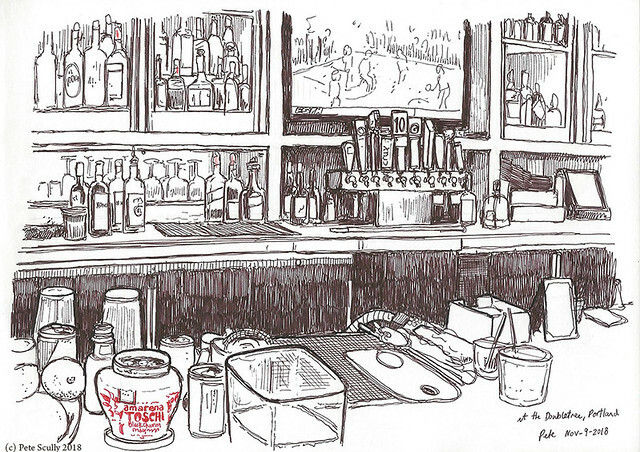 I sketched him later during dinner as well as part of the group at the Indian Tiffin Room. Speaking of signing books, this is Stephanie Bower from Seattle. I really like Stephanie’s artwork, very architectural and full of light, and she is a delight. 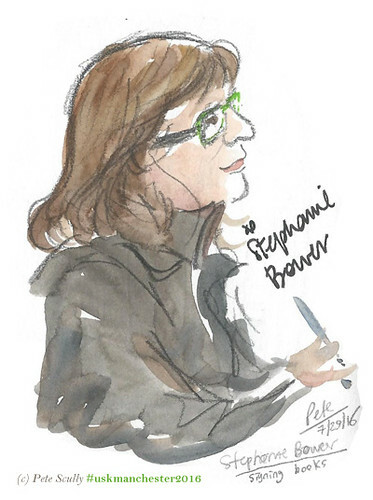 Her book “Understanding Perspective“, the latest in the Urban Sketching Series, just came out, so she was signing copies at the Symposium (I bought my copy in the US) when I sketched her. And here is the book-signing event several of us who have books were asked to come and sign them at. these two fine people are from Quarto books, Ben and Emma, with a selection of publications such as the Urban Sketching Series books (of which Stephanie’s is one), Gabi Campanario’s “The Art of Urban Sketching”, Katherine Tyrell’s “Sketching 365”, Simone Ridyard’s “Archisketcher”, and James Hobbs’s “Sketch Your World”. 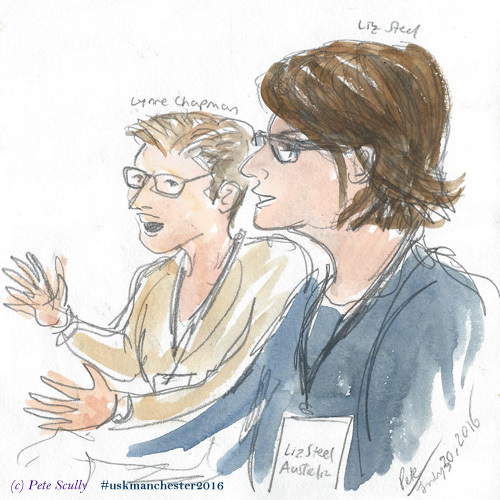 Ok then…where was Creative Sketching Workshop? When I got there they had none. They had some the day before, apparently, but none now. So I stuck around anyway and sketched Ben and Emma, and then after a while they found at the bottom of a box a few remaining copies and put them out, so I added those in! I didn’t sign any though. I never know what to write when signing books anyhow, I always think I should write “Happy Birthday”! At the final Closing Ceremony party at the School of Art, I was already feeling tired, but I did spend time talking to people and sketching, saying my goodbyes and see-you-in-Chicagos, and I’m very glad to have rubbed shoulders with so many international sketchers, old and new friends. 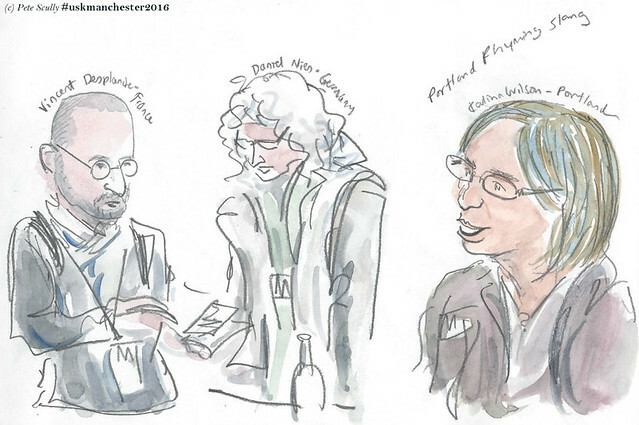 The funny thing about urban sketching symposia is that you might only say a few things to someone, see them in a few workshops, raise a drink and say “great job on all the sketching, here’s my Moo card” but then over the next couple of years you make a point of Liking their FB pages, commenting on their sketches, checking out their websites, being inspired by their prodigious output, and then next time you see them in another country you feel you know each other a lot more, and it all begins to feel like a big global sketching family. 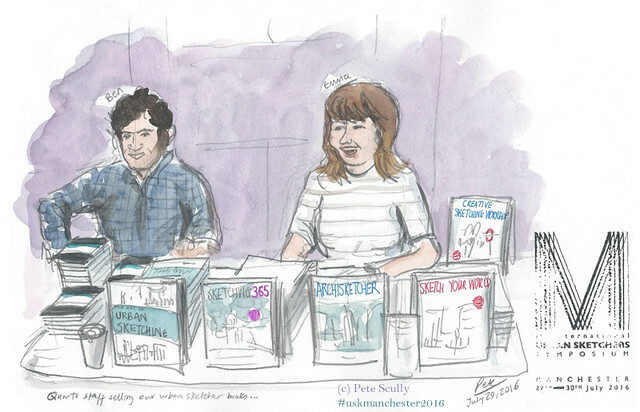 Above, on the right is Vincent Desplanche, from France, who I met briefly last year in Strasbourg and was blown away by his sketchbooks, and who I have followed with great interest over the past year, it was great to see him again in Manchester, and hopefully we’ll sketch together in the future. 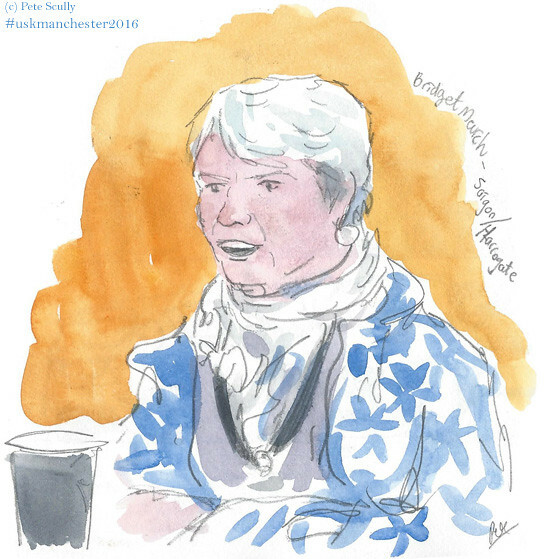 He is talking to Daniel Nies, from Germany, who I met for the first time in Manchester but I recognize from the Urban Sketcher group on Facebook. He told me that he is a beekeper, and was very interested in the bee symbol of Manchester (though it’s an inaccurate bee, he said! ), and made a really cool lino-print of that same bee emblem. Incidentally the bee represents the worker element of Manchester, the home of the Industrial Revolution. 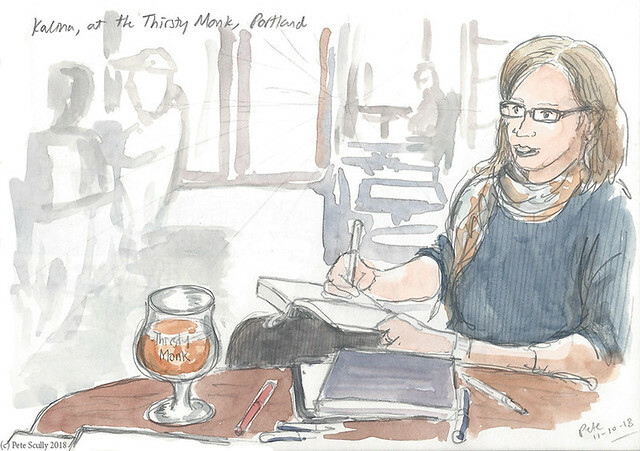 On the right is Kalina Wilson from Portland (aka Geminica), who I’ve known since the first symposium (uskpdx2010) and feels like an old sketching buddy. Also a fellow pirate. Here she is disbelieving me when I tell her that I used to teach Cockney Rhyming Slang in classes at a university in Belgium, but this fact is absolutely true (it even came up in their exam). So glad she was able to make it to the UK this summer, and she even came to the Wren crawl the weekend before in London. Here are a couple of sketchers from Yorkshire (I do like a Yorkshire accent! 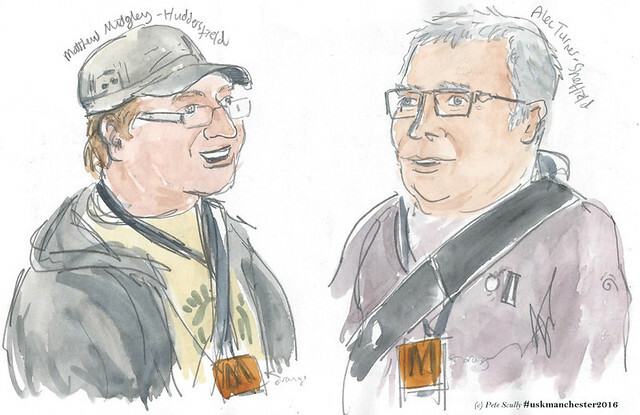 ), on the left is none other than Matthew Midgley from Huddersfield, who I have wanted to meet for years, I love his artwork. Super nice guy, who likes to draw food. 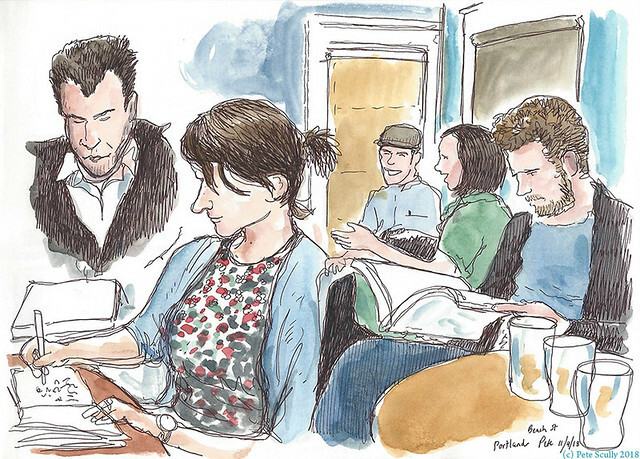 On the right is Alec Turner, who I did not know, but was also friendly and a nice subject to draw. Next up was Ed Harker from Bristol/Bath, who I had spoken to earlier in the day, and whom I saw sketching me in his long accordion notebook. Well, I couldn’t resist sketching him back! You will notice that I am sketching most of these people in pencil, which is quicker and a bit more expressive – I’m doing this more, and it’s fun. Little dab of paint, lovely. 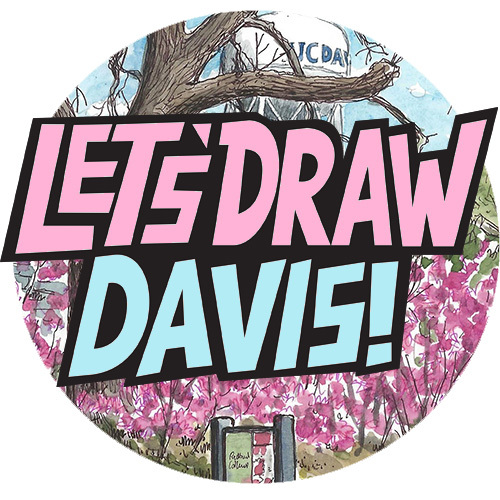 Ed was a lovely bloke, and his sketches are lively and fun. Ok now these were sketchers dancing at the closing ceremony party. The pen scribble is an aborted attempt at sketching Marina Grechanik that just didn’t work. The other sketches on the page however are obviously super accurate and obviously detailed likenesses. 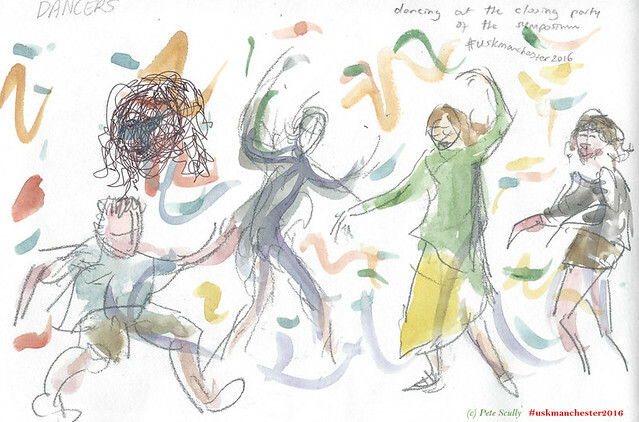 Maybe not, but sketching dancers isn’t easy – it is fun though.Two of them I do recognize, the others I don’t know who they are. There was a lot of dancing; they even did the Conga. Pete doesn’t do the Conga. 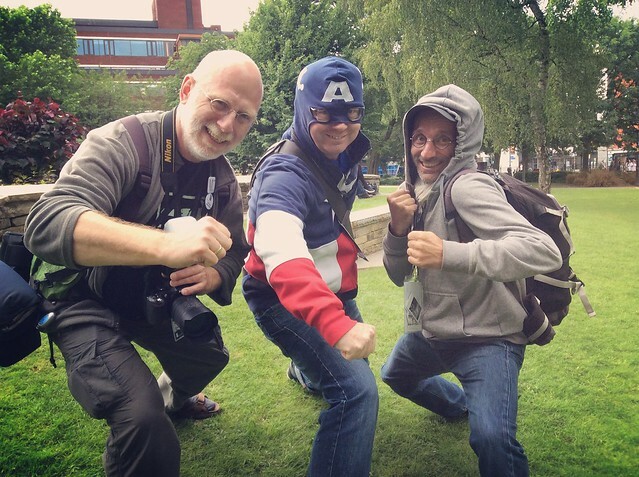 Pete does dress up as Captain America and pose heroically though. Here I am with Marc van Liefferinge from Belgium (a photographer whom I met in Strasbourg last summer, this time he was photographing the big symposium! ), and Vincent Desplanche from France. 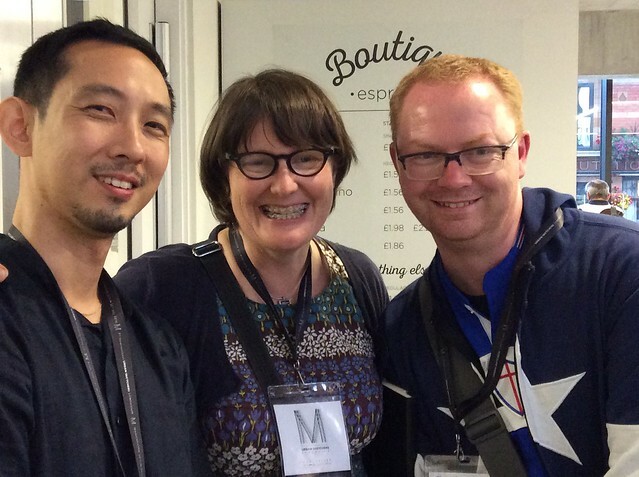 And finally, Liz Steel once more, and Paul Wang from Singapore. 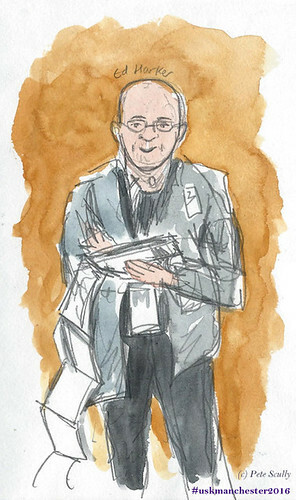 More old Urban Sketching friends! I remember nice evenings at dinner with Paul and Liz in Lisbon and Barcelona. Hopefully again in Chicago!